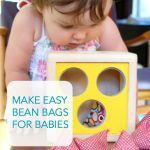 If you’re looking for ways to mix up your baby play time routine, you might enjoy trying this simple activity with materials you may already have in the closet and recycling can. I often wax poetic about my preschooler’s creative pursuits while my little one makes the occasional appearance in the background of photos. So I thought it was about time I brought her (and her “generation”) to the forefront of this site. 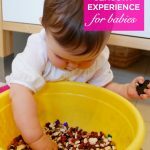 I’ve posted before on creative exploration for babies (See Sensory Play for Babies), and thought you might like to see this idea that supports a baby’s natural curiosity, fine motor skills, and focus. 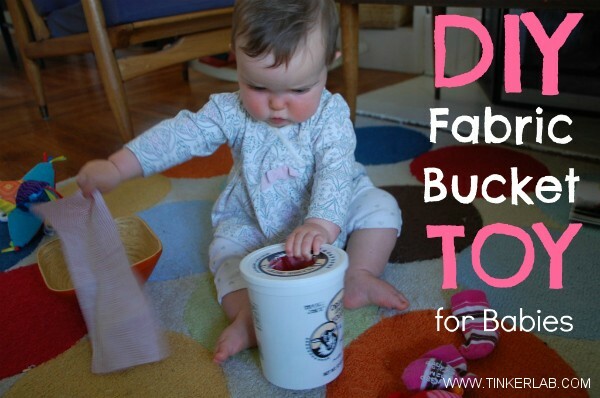 If you’ve ever placed a baby near a box of tissues, you’ve most likely witnessed complete removal of every single tissue, along with multiple attempts at eating half the stash. Playing off of this idea, I created a reusable “tissue box” from a tall yogurt container filled with tissue-sized scraps of colorful fabric. I cut a hole in the lid that was wide enough for her to drop a hand into. 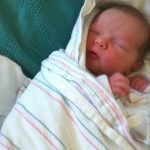 For a wide variety of well-written articles about fostering a baby’s growth, one of my favorite writers on the topic is Janet Lansbury. 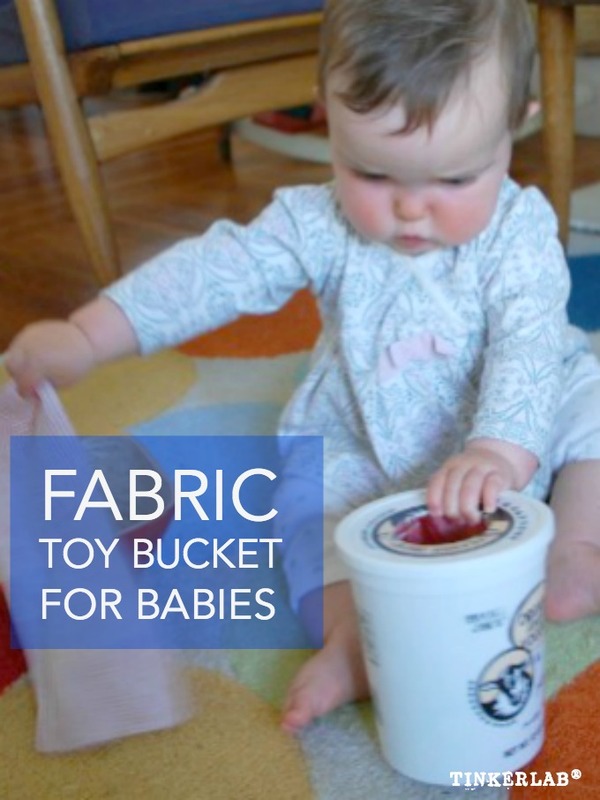 Anna of The Imagination Tree, wrote this must-read post about Baby Treasure Baskets. I have at least two of these in my home at all times that engage my daughter’s senses and capture her thoughts. 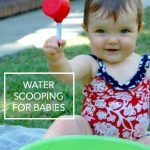 She also has a Baby Play category on her site that’s well worth exploring. okay, first – what a cutie pie! Love those cheeks!!! 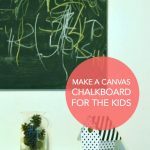 And, as always, love the activity idea! Rachelle, This is so great! 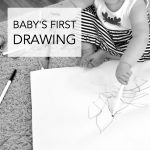 I enjoyed the sweet pictures of your baby, and her focus is evident! I have worked with toddler aged children (18 months to 2), and often provided baskets of samples of cloth with various textures, colours, etc. 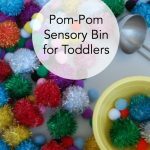 I think there is a lot of learning, for children through their senses, as well as brain development which is essential in infancy. 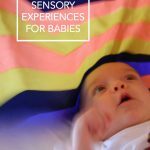 I also have found that somehow sensory experiences clear a child’s mind, and relaxes them so then the child can sit and attend to stories, or instructions. I enjoy these baskets over at Imagination Tree as well, and am working on a few for my daycare work. 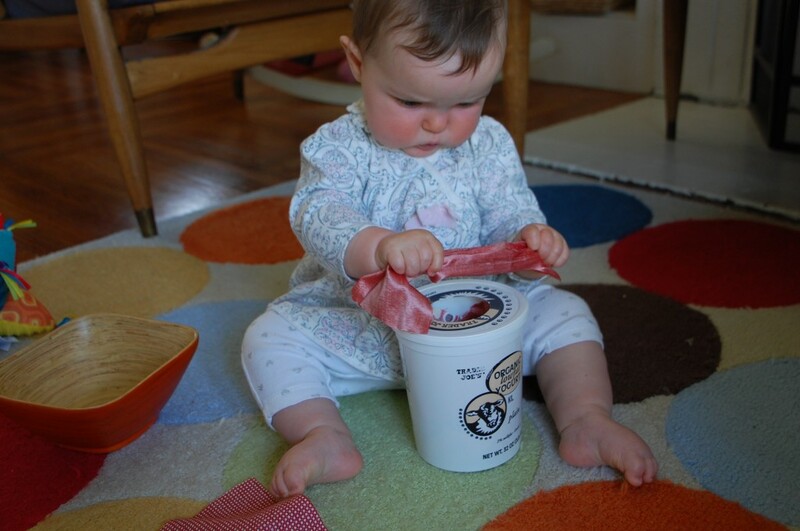 For years I’ve had an old ice cream pail, which I use as a surprise/ sensory game. I’ll try to post a picture of this in a few days over at my blog. Brenda: You are so right! And this is exactly why these sorts of activities trump TV experiences. A baby’s brain grows at such a quick pace, and every experience is an opportunity for learning and growth. I also agree with your point about the relaxing element of sorting, focusing, and feeling. Thanks for sharing. What a cool idea! And she is just adorable! My Aunt also works for a fashion designer, so I will have her collect up some great colors and textures. Thanks again so much for all your great ideas! Rachelle, I love seeing “I” make an appearance. Eleanor would really get into this, too. This morning, she discovered the toilet paper dispenser and enjoyed yanking the loose end and then stuffing it in her mouth. She is also crazy for scarfs with fringe. Maybe I can combine the two ideas and give her something equally “dispensable” but less likely to dissolve into a drooly tissue mess. PS – what a cutie!! Oh my gosh, the expression on your baby’s face is absolutely beautiful! Thank you so much for this post and your kind and supportive recommendation. Yes, infants are very focused and serious people if we allow them to be! 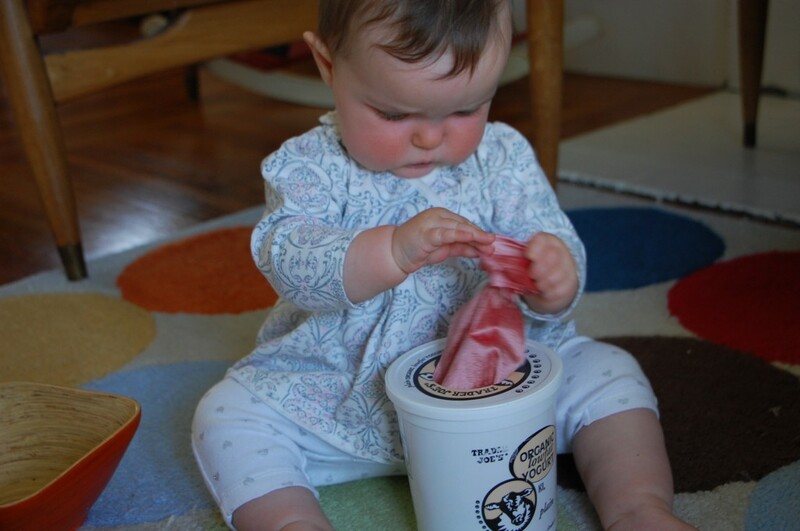 Would you look at the concentration on your baby’s face! Beautiful. So sweet Jenny. Thanks for stopping by. So nice to see some baby ideas. I too am always whipping up fun and educational activities for my toddler while baby sits and watches. Given he is only 3 months old, but it is never too early to start. Oh and he loves the scarf trick. Was a big hit with my 2 year old when she was young too. OMG! I am making one of these! Thanks! Off to raid my fabric stash! And oh!! Those CHEEKS!! This is a great idea!!! I am making one for my son tomorrow!! I know he will LOVE it and I have all kinds of scraps that need to be used! Can’t wait to see him play with it!